After the extreme success of the new but famous Indian author Amish Tripathi for his novels The Immortals of Meluha and The Secret of the Nagas, he is back with the next book in the succession. This third book will finally conclude this Shiva Trilogy. This third part has been titled as The Oath of the Vayuputras. Yesterday this book came to light on his facebook fan page. 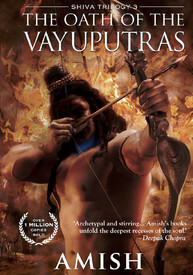 This book The Oath of the Vayuputras is available to pre order. One can pre order this book from Flipkart. Click here to go to flipkart page where this book can be pre ordered.